Rating RP 96 Robert Parker's Wine Advocate The 2013 Nicolás Catena Zapata is a blend of 72% Cabernet Sauvignon and 28% Malbec from the La Pirámide, Adrianna and Nicasia vineyards. It is perfectly clean and focused, a noticeable improvement over the 2012 vintage. The Cabernet Sauvignon from this cool vintage seems to have a more restrained character that made me think of Cabernet Franc, very classical and serious. They have been harvesting earlier and earlier in search of balance and freshness, and the strategy has definitely worked. It has great freshness and focus, and the lower alcohol and acidity seem to make the wine integrate the oak very nicely. 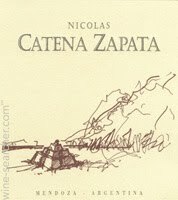 This has to be one of the finest vintages of Nicolás Catena Zapata.